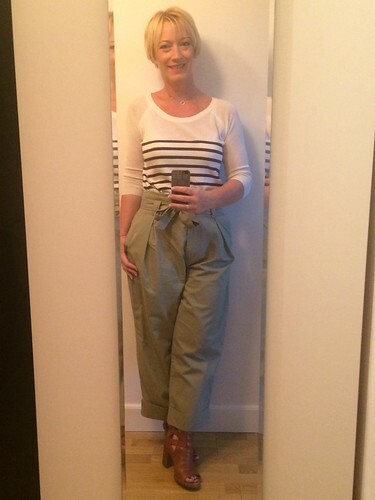 Summer is now well and truly over… we’ve had a couple of nice days since my latest ‘outfits on IG’-review, but we’ve also been having grey, wet and windy weather… so in this review you see all sorts of clothing! 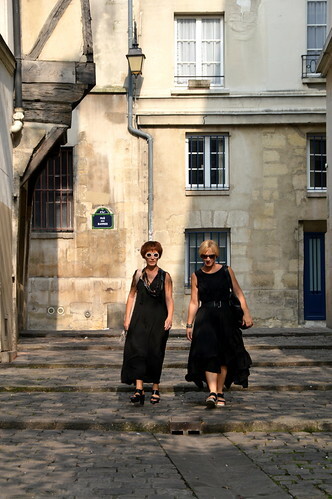 The last days of August were sooooo very nice… I had a trip to Paris where I wore my ab fab Maje skirt with a frilled top… I just loved how the skirt floated behind me in the narrow streets of the Marais 😀 Check out this post for lots of pics of this lovely Parisian neighbourhood!! A couple of days later I was walking the streets of London in my H&M maxidress. I love this dress and it was perfect on hot day in the city! 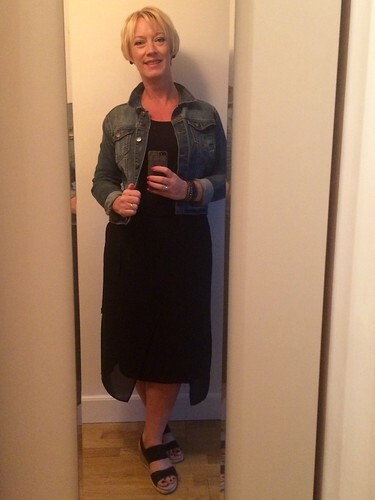 One of my favourite summer dresses was this black one I bought in Utrecht. It’s very comfy and hides all the bits and pieces you don’t want to be seen as it has a layer of flowy fabric. A denim jacket and wedge sandals make this dress a bit more casual in an instant! On a chillier day I opted for this marine striped sweater from Liu Jo Jeans. I love the combination with the khaki pants! The following outfit I wore to work. At the office it is often quite warm, so a cardigan can be ever so handy! It was the first time I wore these sandals to work. They are really posh but I dressed them down with my distressed denim. I wore my sandals again a couple of days later. A bit more fancy this time as we went to a wedding reception. 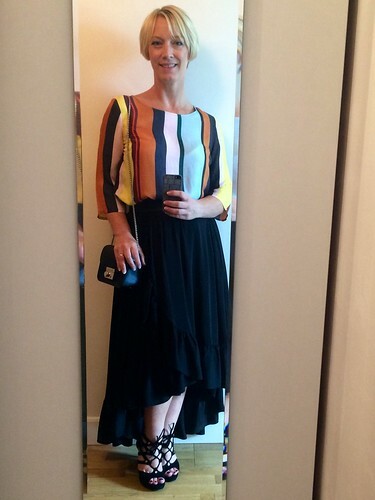 The Maje skirt was perfect for the occasion, along with the silk striped blouse from E5. 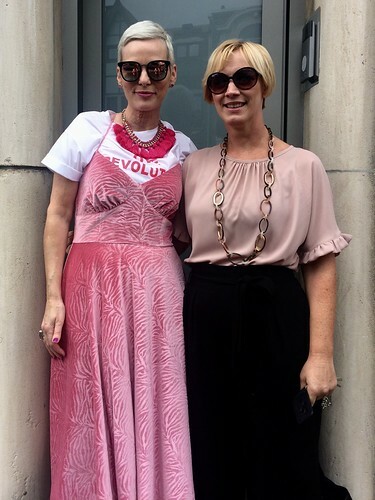 For a meeting with Greet Moens from ‘Become who you are‘, I wore my blush blouse with my Les Cordes necklace… we’re both wearing pink, but these are such different styles!! And then the weather got bad… really bad!!! So layers came to the rescue! I love the soft fall colours in the outfit below. 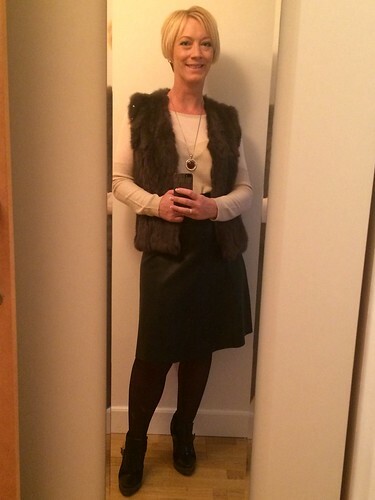 Luckily I could ditch the cardigan most of the time as at the office it’s always quite warm! Fake leather and fake fur for another day at the office! That fake fur vest is fabulous! It gives so much warmth on the back… loved wearing this one! I got it at a closet sale and I know I will wear it a lot the coming months 🙂 You can see more of this fake leather skirt in this post! 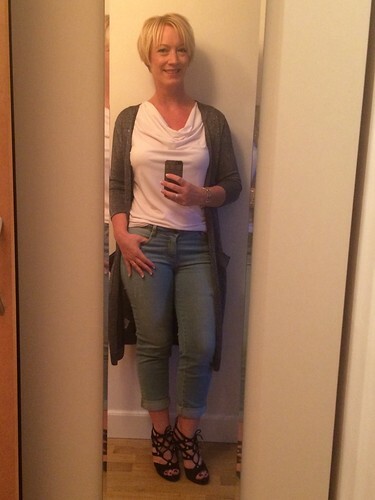 Another work outfit: my jeans (which I haven’t worn in a while because I had gained some weight!!) 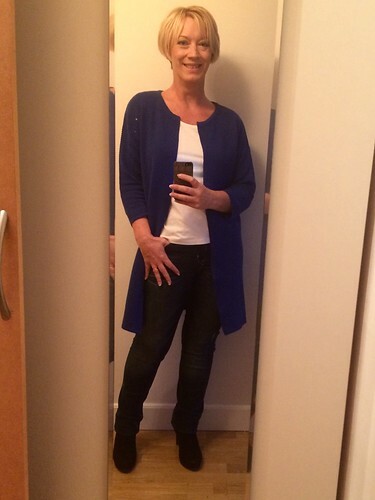 and a cardigan I bought the day before at Lidl! It’s from the Heidi Klum collection and even though it was only 20 EUR, the quality is great 🙂 And I also love the colour. It’s much brighter than on the pic below! I will do an outfitpost about it in October probably! 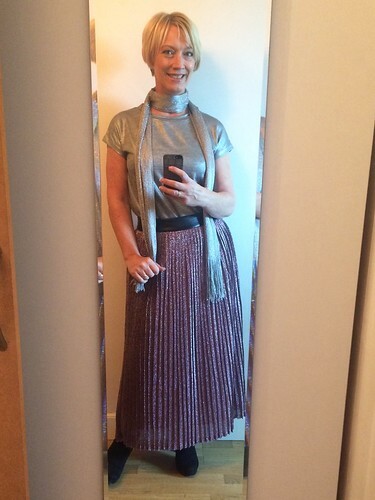 And then there was this bling outfit with my lovely sparkling pleated skirt you could see in this post, my metallic grey t-shirt and a silver scarf. 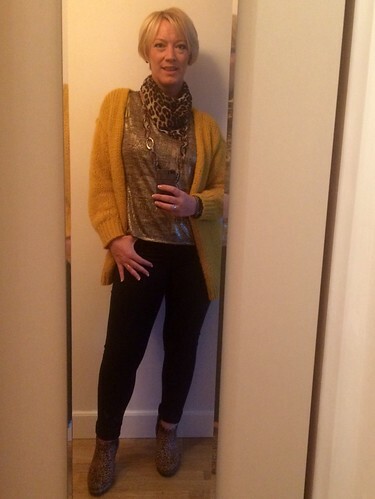 This entry was posted in Fashion, My outfits on IG, Outfits and tagged didi, e5, esprit, Fashion, fashionblogger, H&M, heidi klum, JBC, liu jo, steps, tamaris, timberland, trussardi jeans. That H&M maxi dress looks so chic, you would never guess where you bought it.